First Line: Maylene put one hand atop the stone for support; pulling herself up from the soil got harder every year. Rebekkah Barrow must return to the small town of Claysville-- the town she's been trying to escape most of her life-- to attend her beloved grandmother's funeral. Many times as a child Bek would accompany Maylene, and she never forgot the peculiar ritual her grandmother would always perform: she would take three sips from a silver flask and say, "Sleep well, and stay where I put you." As Bek stays in her grandmother's home, she discovers that there is more than meets the eye in Claysville's strange funeral rituals. The worlds of the living and the dead are dangerously connected in this town, and if the dead are not properly cared for, they will return to the land of the living to sate themselves with food, drink, and stories. 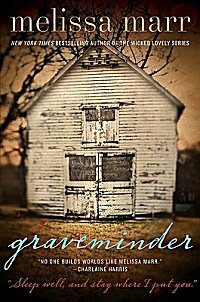 Only the Graveminder-- a role that Bek has inherited-- and the Undertaker--Byron Montgomery, a man with whom Bek shares a complicated past-- can set things right once the dead begin to walk. I was sent this book by the publicist unsolicited, which can be a very dangerous thing. I am under no obligation to read or review books I haven't requested. To add to the mix, fantasy is not a genre that I care for. But something about this book caught my eye, and the book did hold my interest throughout. Bek and Byron are both well-drawn characters, and I sympathized with their previous attempts to avoid what they didn't realize was their destiny. The descriptions of the land of the dead and the people who live there were creepy and made me uneasy, and the dead walking in Claysville actually gave me the shivers. Only two things marred this book for me. The person behind all the evil doings was easily deduced, which took away some of the suspense. Also, even though Bek and Byron were new to their roles, by the end when they were surrounded by a group of the "bad guys", they dispatched them very easily off stage. I feel the suspense would have been ratcheted up even more if everything had been kept on stage and if they'd had more problems in trying to set things right. Am I now hooked on the fantasy genre? No. But I did enjoy reading this book. I would imagine that fans of this type of book will enjoy it even more than I did. my experience with this book is very similar to yours, except that I did not quite figure out the evil one behind it..which in retrospect is fairly obvious. but i did enjoy it! Surprisingly! Caite-- It's good to see that we were both pleasantly surprised! Glad to see you enjoyed this one even if the suspense part wasn't as good as it could have been. I like fantasy, so I'm interested to see what I think of this one. Kris-- I'll keep my eyes peeled for your review!